Gauge: 7 sts / 9 rows per inch GET IT RIGHT. It probably doesn’t matter for this project if you are knitting it only to learn the techniques but swatching is an indispensable habit unless all you want to knit is scarves. Size: to fit 20 inch chest. Finished chest measurement: 24 inches. If you are not familiar with any of these maneuvers now is the time to dust off your knitting reference books or check on line. Cast on 56 sts for back neck and shoulders, using a tight cast on such as long tail. K to the last 5 stitches on needle. Wrap that 5th stitch and turn. P to the last 5 stitches on needle. Wrap that 5th stitch and turn. K to the last 10 stitches on needle. Wrap that 10th stitch and turn. P to the last 10 stitches on needle. Wrap that 10th stitch and turn. 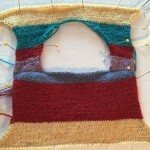 Slip the first stitch then K to end, picking up wraps and working them with their stitch. Slipping the first stitch of every row to form a chain selvedge, work even for 20 rows. 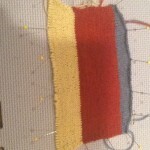 Do not slip the first stitch on this diagonal section. Put these stitches on hold. The cast on edge is at the top of the picture, in blue. 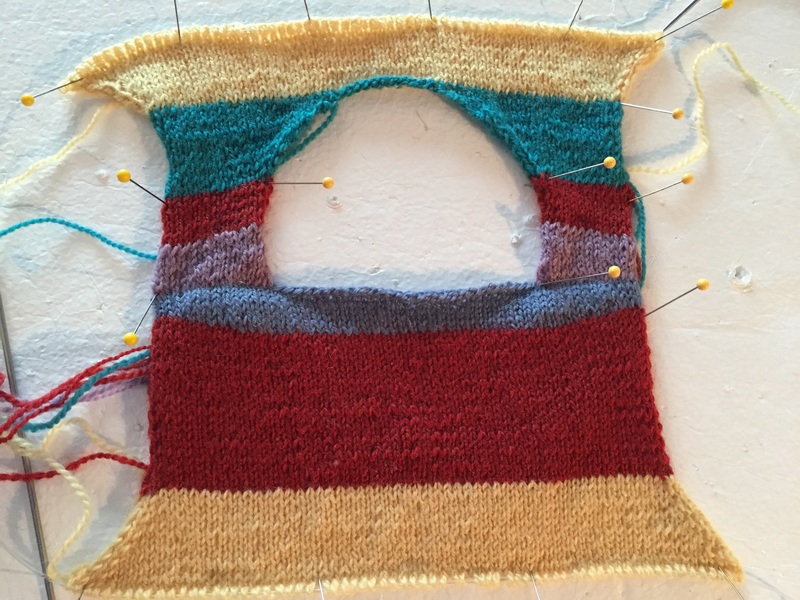 The red section is the straight rows and the yellow rows are the armhole increases. Work both sides at once using 2 balls of yarn or 2 ends from the same ball. Pick up first 14 stitches on left shoulder. Using second ball of yarn pick up the last 14 stitches on right shoulder. This leaves the center 28 stitches of the back unworked. Work short rows to correspond to back shoulder shaping; note that left shoulder you’ll be wrapping and turning on a knit row; on the right shoulder you’ll be wrapping and turning on a purl row. You should end the short row section on a purl row. On the next row knit to end, picking up the wraps and knitting them with their stitch. Slipping the first stitch of every row on both the armhole edge and the neckline edge, work 6 rows even. Slip the first stitch of the every row at the armhole edge. Do not slip the first stitch at the neck edge. Increase at the neck edge of both sides of the front, 2 stitches in from the last stitch, for a total of 4 increases on each side of the front for a total of 18 stitches for each side of the front. Cast on 2 stitches on each neck edge a total of 2 times each side for a total of 4 increases for a total of 22 stitches for each side of the front. Work to neckline edge of left front, cast on 12 stitches, and continue to end of the right front using same ball of yarn. You can cut the second working yarn leaving enough to weave in at the end. NOTE: It is entirely coincidence that the neckline shaping on this sweater is completed just before the armhole increases. This may or may not be true on other shapes or sizes, in which case the neckline increases and the armhole increases might require working both kinds of shaping AT THE SAME TIME. Work the same as the back; front will have a total of 70 stitches. When increases are finished, p 1 row. Next join the front and the back. Work across front, cast on 7 stitches, place a marker for the beginning of the round, cast on 7 stitches, work across back, cast on 14 stitches. The purple section on the front is the short rows for the shoulder. The Red section is the “work even” section for the armhole, the turqoise section shows the increases for the neckline and joining the two fronts. 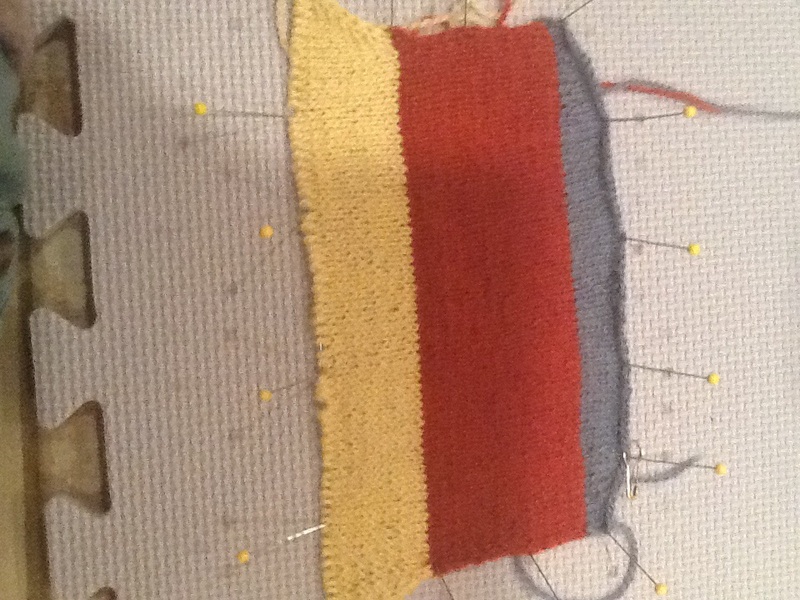 The yellow section is the increase section for the armholes and matches the yellow section on the back. Next step: Joining front and back. I use Sweater Wizard, a sweater design program that is no longer available. It generates schematics, but a sweater knit top down with set in sleeves is not one of the options. I usually will generate the schematics to prepare the pattern to knit top down. i will add the schematics from the program for this sweater. This entry was posted in free pattern and tagged baby, pullover, set-in-sleeve, top-down on December 16, 2014 by nina@ninaknit.com.